On Friday, the 21th of March, early in the afternoon, Mr. M. Ballerstein, a gentleman 54 years of age, and in ordinarily fair health, was shot by accident at his place of business. What sort of accident? Alas, the report sheds no further light on the matter. 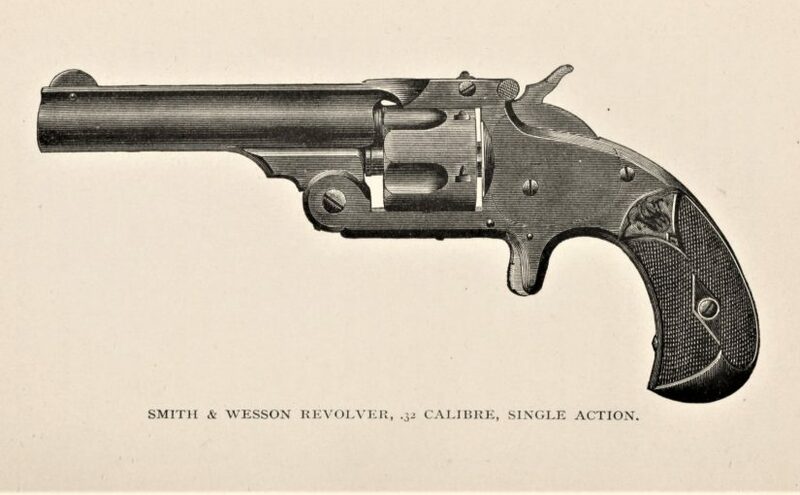 The mouth of the pistol—a Smith & Wesson revolver—could not have been at a greater distance than five or six feet from his head; the ball was twenty-two hundredths of an inch in calibre. He was struck on the right side of the forehead, at a point 1 1/8 inches from the middle line and 1/8 inch above the bony margin of the orbit. He fell, and became unconscious almost immediately. The persons causing the accident left in a fright, thus leaving him alone to recover at his leisure. So the victim was shot in the head at point-blank range by unnamed persons who scarpered rather than seek medical attention. It sounds more like a stick-up than an accident. When consciousness returned—after a few minutes, it is supposed—he was dumbly impressed with the sense of physical injury, rose, gathered his keys, and left the office, locking the door behind him. Which isn’t bad going, if you’ve just been shot in the head. At this time he felt something trickling down his face, and now, for the first time, had distinct recollection of the accident. He unlocked the door, went to the mirror and there discovered the wound in his forehead. Still in a confused condition of mind he washed his face and then walked out once more, again locked the door, and proceeded homeward, a distance of nearly a mile. It is not clear whether he genuinely couldn’t remember what had happened to him, or if he just didn’t want to worry his wife. My money is on the latter possibility. A half hour later I was with him. He was conscious, rational, and free from pain. There was an appearance of exhaustion on his face, but those around had just administered a tablespoonful of brandy, and very soon he recovered his usual looks. It is doubtful whether such a small amount of brandy would have had much effect – except, perhaps, improving the patient’s mood. A few drops of blood oozed from the wound, which presented clean edges. With great care and delicacy of touch I introduced a silver probe through the soft parts, and then, with a slightly inward turn, passed it by the ragged edge of the perforated bone into the cavity of the skull. The direction of the probe was mainly from front to back, with a slight turn upward and inward. It was advanced to a depth of 2¼ inches, where it met the resistance of an elastic body, giving a little, then bounding back—probably a membrane. A risky procedure. What was the doctor trying to achieve by inserting a metal instrument inside the man’s skull – and, therefore, inside his brain? Perhaps he hoped that he’d find the bullet, and would then be able to extract it with forceps. Being left thus in the wound, a slight and regular vibration was perceptible. The pulse beat seventy-two, and the only general symptom that could be referred to the injury was a perceptible effort in speaking and some thickness. Sight, hearing, taste, smell, and feeling remained perfect, and no trace of paralysis or convulsion could be noticed. Perfect quiet, occasionally a tablespoonful of milk, hot things to the feet, and a cool, wet cloth to the forehead—these were ordered, stimulants and other food being expressly forbidden. Dr Mayer invited two eminent surgeons to examine his patient, but both agreed that an operation to remove the bullet would be too risky. All that could be done was to watch and wait. Until the sixth day there was little change. The pulse remained at seventy-two, the patient claimed to lie comfortable, and except some prostration and the slight indistinctness of speech, there were no general signs of injury. The first orders had been strictly adhered to, and the wound kept open by a wax bougie, which was introduced to the depth of three-quarters of an inch several times a day. A bougie is a cylindrical surgical instrument. They are still used today to aid the insertion of breathing tubes into the airways. The doctor’s intention was to allow any pus to drain away, and it’s possible that he was hoping that the bullet would find its way out at the same time. A week after the accident, the patient took a turn for the worse. From the sixth to the ninth day the speech grew more indistinct, and the pulse rose to eighty. On the tenth day he could hardly talk, and would not swallow unless expressly ordered. The wound had been allowed to scab over, and he complained of soreness in its vicinity. Inclined to sleep much during the day, he had a slight convulsion that night, after which the right side of the face seemed drawn up a little. In the morning two more convulsions followed. A bad sign, suggesting neurological injury. A bag of ice was put on his head, and the former treatment continued. Next day (the twelfth) he was entirely speechless, signified that he had great pain in the head, and wore an expression of collapse. The scab was taken off the wound, and a teaspoonful of creamy pus spurted forth. Later in the day a string of purulent matter was found in the neighborhood of the wound. This seemed to have the effect of relieving the pressure in the head. Quite plausible. Intracranial pressure is one of the main dangers of brain injury: swelling (or, as in this case, infection) can compress and damage the delicate brain tissue. On the following day he spoke audibly but very indistinctly, and the pulse, which had been at eighty, came down to sixty. He was perfectly conscious and rational. The wound was kept open, but no more pus came forth; and, the morning after, six leeches were placed upon the forehead and the bites encouraged to bleed for three hours. I’m sure that made a great difference. demanded more solid food, seeming fairly to get well, when suddenly a great faintness overcame him in the afternoon of the twenty-first day. A few teaspoonfuls of whiskey relieved this, and now, with a steady pulse of seventy, he made quick and reliable advances. He spoke clearly, was very cheerful, read the papers, and insisted on giving some directions about his business. By early May, six weeks after the accident, he was going for regular walks with a friend. On the 20th he walked to his office, distant a mile. Soon after he commenced to use the cars regularly, and, in fact, attended to all his duties, both in his business and the societies of which he is a member. At present he claims to be perfectly well, with this exception: once in a great while a moment’s difficulty in recalling some fact, or getting hold of some idea or word, will occur; nor is he quite so strong as before. Minor memory loss is a fairly routine finding in the aftermath of a brain injury. Still, all things considered, this is a pretty good outcome if you still have a bullet inside your skull. And it wasn’t all bad: his digestion had improved. But a dyspepsia which annoyed him previous to the accident was totally dissipated by the regimen enjoined.